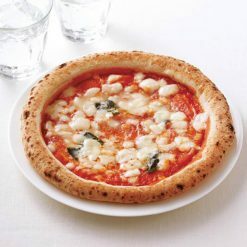 The crust of our pizza Margherita is prepared faithfully to the specifications of authentic Neapolitan pizza. Made using Mozzarella cheese as well as Grana Padano cheese, creating a pizza with a rich, deep flavor. Each pizza is 210g and approximately 21cm in diameter, and arrives frozen. 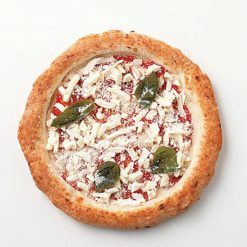 Enjoy genuine, restaurant-quality pizza Margherita in your own home, made from the dough up with the utmost care. Includes crust made faithfully to the specifications of authentic Neapolitan pizza. The pizza dough was fermented at low temperatures for long hours, giving it a springy texture which acquires a nicely crispy surface when baked. The dough of each pizza Margherita is stretched by hand, making sure that air gets into the edges of the crust to them a puffy quality. For this pizza we use Mozzarella, a cheese which is highly esteemed by even pizza specialty shops. Then, we add Grana Padano cheese, creating a pizza with a rich, deep flavor. For this pizza, we use Mozzarella cheese from Italy, the birth nation of Mozzarella. The cheese is from Caserta in Italy’s Campania region.